arch and uname report screenshot. In theory, you should already know the architecture of your computer because, after all, you installed Linux on it in the first place. Of course, it could be the case that you didn't install Linux on the computer and you need to know the architecture before compiling a package to run on it. You might think that the type of architecture is obvious, but when you take Chromebooks into consideration there is a possibility it is either x86_64 or arm based, and it isn't necessarily clear just by looking at a computer whether it is 32-bit or 64-bit. Other potential architectures include i486, i586, i686, ia64, alpha and sparc. uname is used to print all sorts of system information about your computer of which the architecture type is just a small part. You can use switches to specify just the information you want to show. It is also possible to get full details of the arch command by typing man arch. getconf actually stands for get configuration value. It is part of the POSIX programmers manual. The LONG_BIT returns the size of a long integer. If it returns 32 then you have a 32-bit system whereas if it returns 64 you have a 64-bit system. This method isn't fool proof however and it may not work on all architectures. 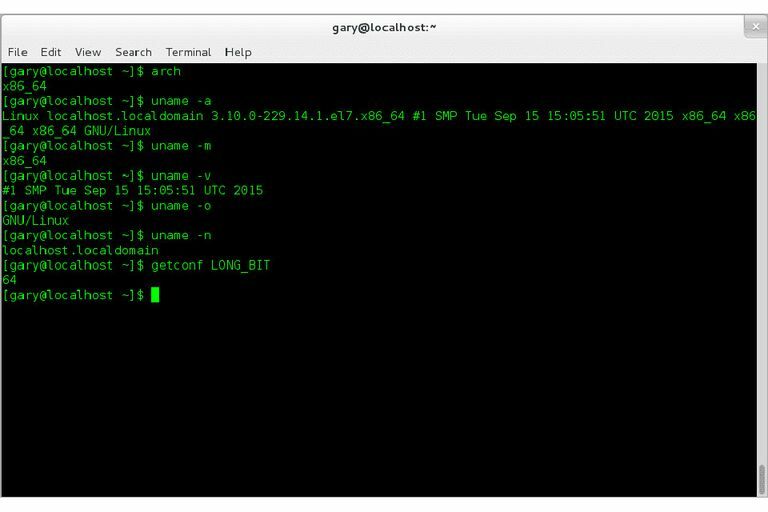 For full details about the getconf command type man getconf into a terminal window. Whilst it is obviously easier to type arch than uname -m it is worth noting that the arch command has been deprecated and may not be available on all versions of Linux in the future. You should, therefore, get used to using the uname command instead.